With the draft on Monday, we’re nearing the end of our MLB Draft profile series. This one is on prep outfielder Nick Schnell from Indiana. Schnell is a bit of a late-riser ahead of the draft. 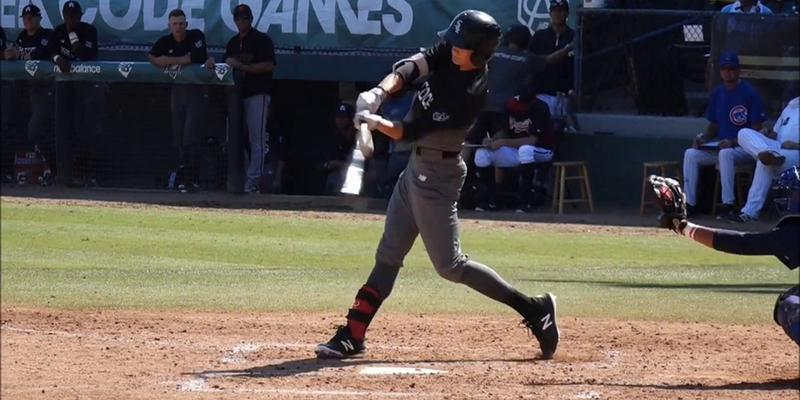 He got hot and hit some home runs in front of some significant scouts, which has helped his draft stock this spring. He’s a legitimate 5-tool prospect, but there are some concerns in his game. The good is that Schnell is an above-average athlete with plus-foot speed and the ability to stick in center field, defensively. If, for some reason, he has to move to right field, he has plenty of arm for the position. He also has plus-raw power, thanks to natural loft in his left-handed swing. It’s usually a good thing to bet on athleticism, and the Dodgers have done that as recently as last year with Jeren Kendall. His athleticism could take a slight hit if he fills out, but he’ll still be a premium athlete. The concerns are not only that he hasn’t played against top-tier competition (in the baseball hotbed of Indiana) but also in his swing. He has an arm-bar and stiff hips that could lead to contact issues down the road. It’s something that can be corrected — or at least improved — with professional instruction, and it might have to if he’s to hit advanced competition (i.e., velocity). But he’s toolsy and scouts dream on his combination of ability and athleticism. Videos courtesy of Baseball America, 2080 Baseball and rkyosh007. With a commitment to Louisville (his Twitter avatar has a large UL Cardinal logo), he might take the full slot-recommended bonus amount to forego that opportunity. Of course, there’s talk that he could go earlier in the round — as high as No. 4 — for a team looking to cut a deal to maximize their bonus pool. Keith Law said in his latest mock that the Dodgers might be the floor for Schnell, so take that for what it’s worth. If he figures out his deficiencies with his swing, he could be an All-Star-level player as a power-hitting center fielder. If not, he still profiles as an average regular with the ability to hit for some power, but also has some swing-and-miss. Either way, he’s an intriguing prospect and could be on the board at No. 30 when the Dodgers select.